Just because the sun is out does not mean I’m putting away my outerwear. A pink trench coat is the perfect spring topper just in case it starts sprinkling again and because it looks super chic over any outfit. 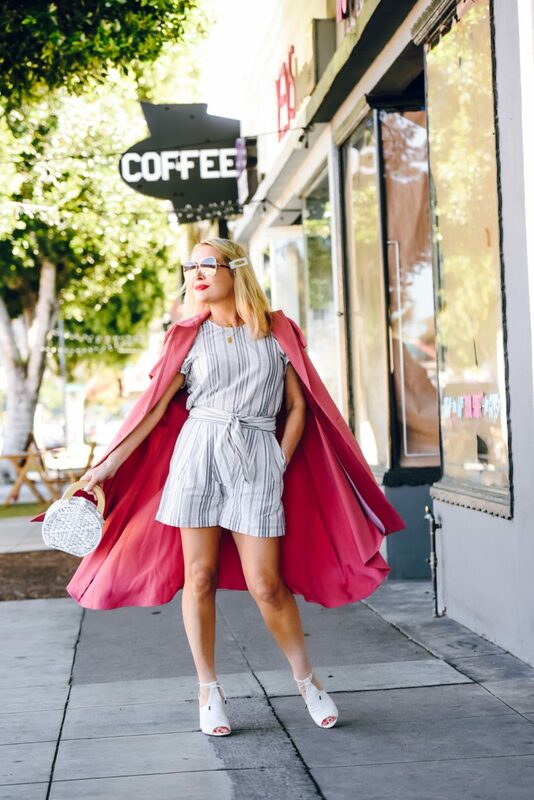 I love that matching sets are still going strong this season and this one paired together could easily be mistaken for a romper but I love that I can wear each piece separately and no one will ever make the association to this look. Another huge trend this spring is the oversized hair pins particularly the pearl ones. I found this one on Etsy (linked below) and it just adds a little femininity & sparkle to any outfit and most importantly its a super inexpensive way to look on trend any time. Its spring break this week which is yet another reminder how fast this year is going by. My not so little boy flew to Arizona to spend the week with his aunt, great grandparents and cousins. Its hard to not have him around but Im not complaining about being able to sleep in a little later all week! Hope you’re all enjoying your week so far, on spring break or not! That’s such a cute and sassy combo dear! love the coat you have there, perfect for spring.